I'd like to preface our story with a small detail about our original home study that may be surprising. 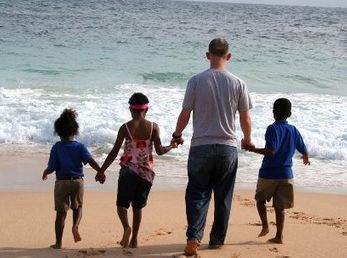 We began the adoption process a few years ago with the intent to adopt a healthy infant girl. It seemed to make the most sense as we had no children at the time and were in our mid-late 20s. As time progressed we became open to siblings and ultimately expanded our age range from 0-1 year to an infant and a toddler. Our family began when we saw a photo of two beautiful children on our agency's "waiting children"20list. We inquired about them and discovered that the youngest child, a girl, had Hepatitis B. We began to discuss the realities of raising a child with an infectious disease and realized that we were open to the opportunity. In time we were able to bring home our children and during our travels to Ethiopia, our children's birth country, we discovered that they had an older sibling who is HIV+. I must admit we didn't give much of a thought to the fact that she's HIV+. We knew immediately that the children belonged together and we'd do whatever we could to reunite them. You may wonder why we didn't give a second thought to adopting our HIV+ daughter. The truth is that my husband and I are both biologists with an extensive knowledge of microbiology and virology. We know that HIV is not spread through common, casual contact. We also know that it is no longer considered a death sentence and is quite treatable through modern medical cocktails designed to not only impede the growth and reproduction of the virus but also to help the immune system fight it off. We are not looking to expand our family in the near future, but I know that if we do decide to adopt again we will definitely be adopting an HIV+ child. There is a need to place "unhealthy" children due to many (irrational) fears.